Pat Steir has been at the forefront of American painting for decades. With an artistic practice that spans half a century, she is a leading force in the development of Conceptual Abstraction. Pat Steir: Artist, is the first film ever made about this groundbreaking woman painter. Culled from over 30 hours of candid interviews with Gonzalez Peña, Steir touchingly evokes her childhood in New Jersey, her young adulthood in NY, her involvement in feminist groups and artistic movements, as well as her deep friendships and alliances with the most influential artists and poets of her generation, including Sol Lewitt, Agnes Martin, John Cage, Anne Waldman, and Sylvère Lotringer. Pat Steir: Artist is an intimate portrait of the artist by novelist/filmmaker Veronica Gonzalez Peña. The warmth and closeness the women feel for each other come across clearly in this visually poetic, highly personal portrait of the great painter. Primarily shot in Steir’s home and studio over the course of 3 years, the film provides a profound, and revelatory portrait of the artist in her world while providing the viewer with a first-hand account of what it is to live an artistically engaged life. 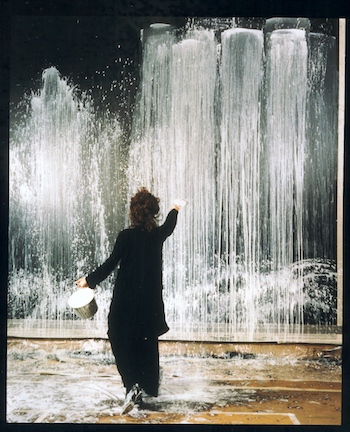 Pat Steir making a waterfall painting in 1990.